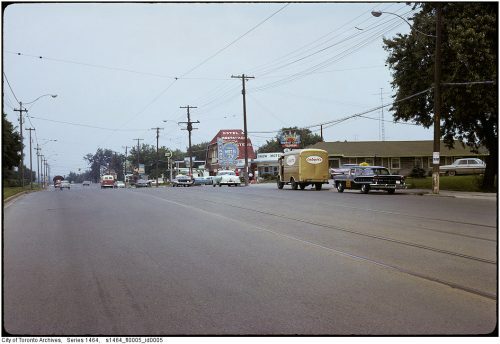 In the two decades following the Second World War, the population of Etobicoke grew from less than 40,000 to over 200,000. Thousands of houses, hundreds of offices and shops, dozens of schools and miles of new roads were built to support this explosion of population. 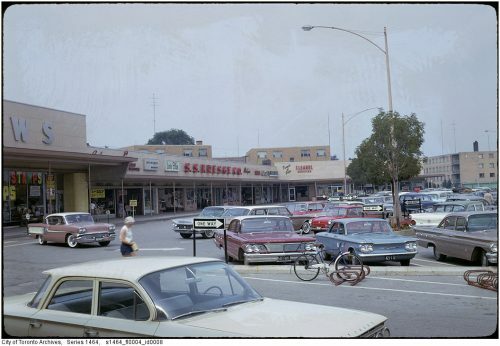 Etobicoke was designed as a modern, post-war suburb. Its growth coincided with the growth in automobile ownership, and this was reflected in its planning. Broad roads and streets, with separate residential, industrial and commercial zoning, became a key feature of the new suburb. Shopping malls and office buildings allowed considerable space for parking lots. 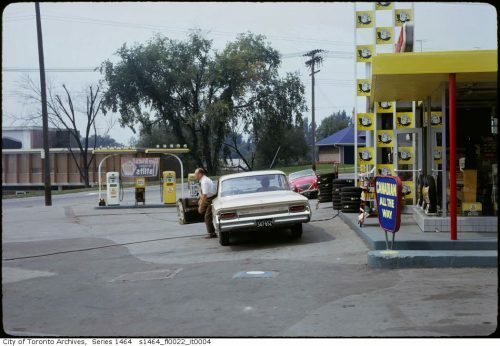 Gas stations were plentiful and positioned on major trunk roads and intersections. Many houses were built with large driveways and garages. The car was king. 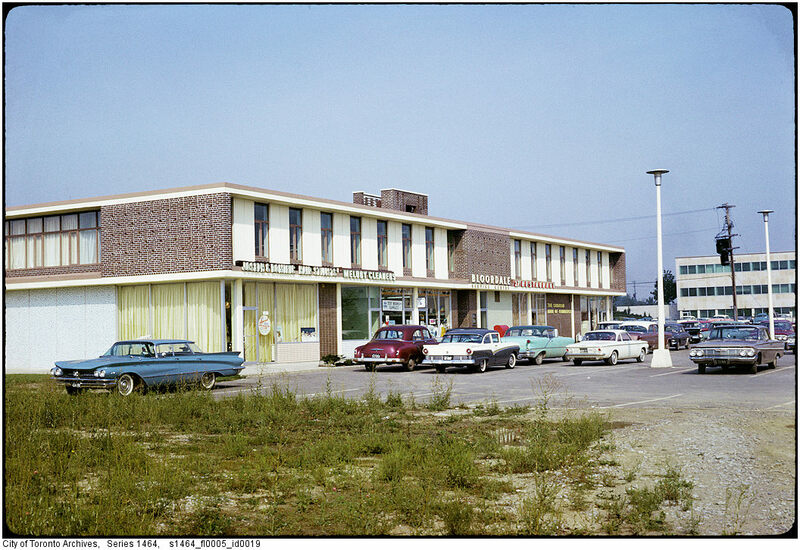 These images are a sample of six hundred photographs taken on behalf of the Etobicoke Clerk’s Department, illustrating this development within the township and borough. They document the evolution of Etobicoke’s built environment at a time of great transition from a rural to an urban landscape. 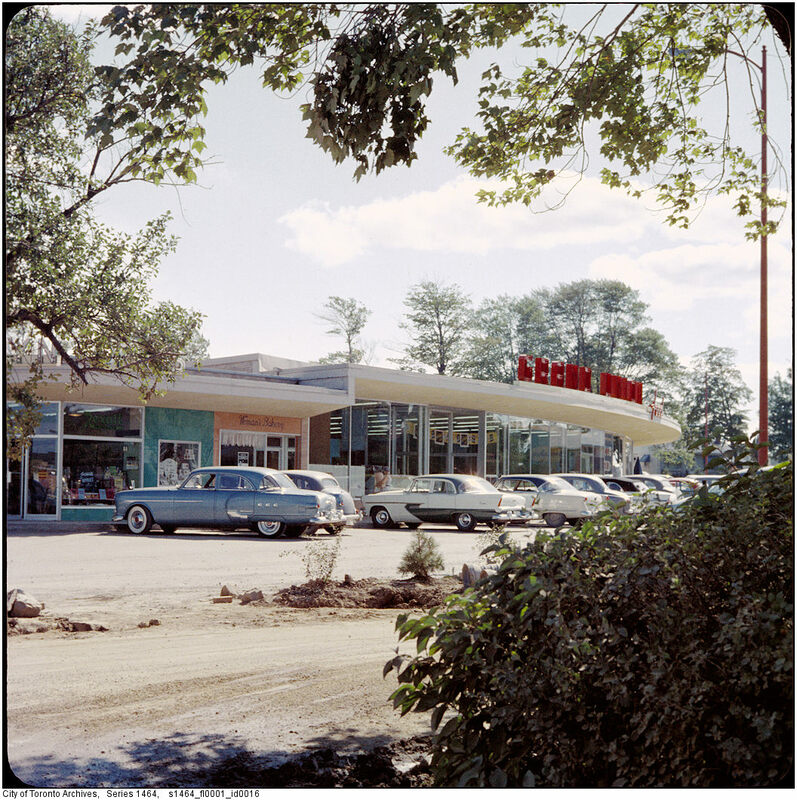 They depict a number of commercial developments that were constructed in the late 1950s and early 1960s. 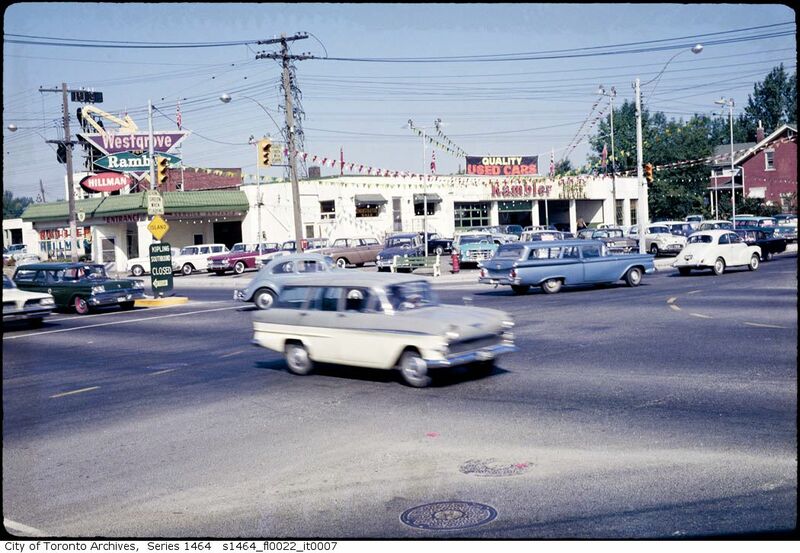 In particular shopping centres, gas stations, and a view of Etobicoke’s famous ‘motel strip’ on Lake Shore Boulevard. They provide some insight into the minds of town planners, and the lifestyles they believed Etobicoke residents would lead in the latter half of the twentieth century. The two shopping centres pictured above are located just a few hundred yards apart. They were constructed in 1955 and 1956 respectively, and continue to serve the neighbourhoods located near The Kingsway in the west end of Toronto. Thorncrest Plaza is situated on the north-eastern corner of Islington Avenue and Rathburn Road and Humbertown Mall is a block to the east on Royal York Road, north of the intersection with Dundas Street. 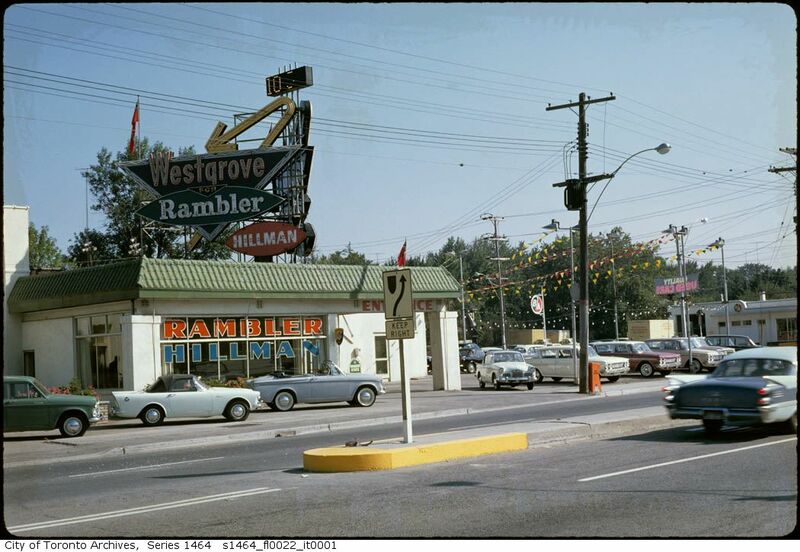 This “White Rose” gas station was constructed in the mid-1950s and was situated on the north-eastern corner of the intersection of Islington Avenue and Dundas Street West. 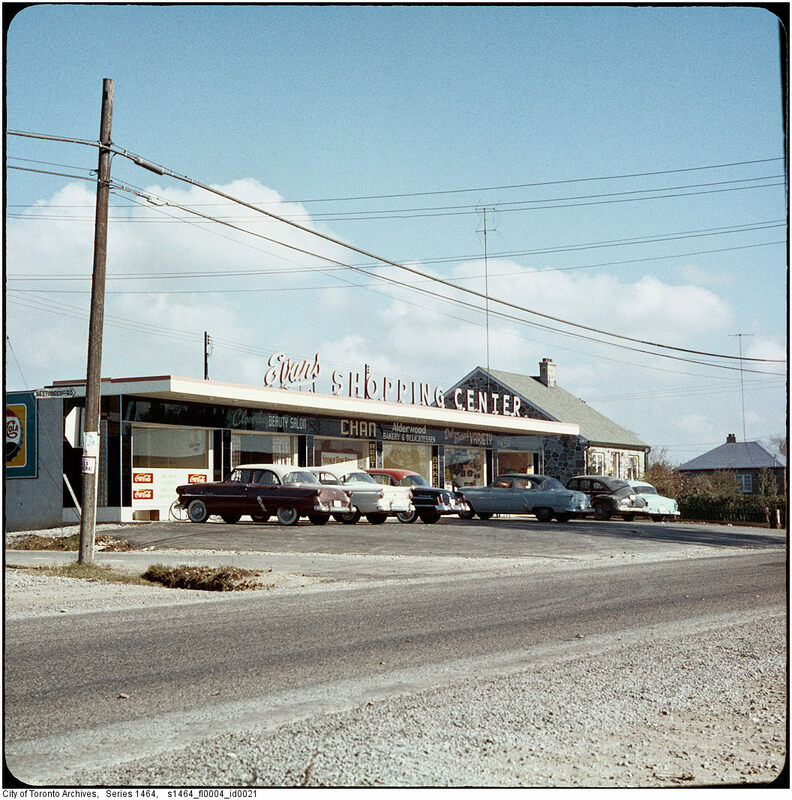 The White Rose Oil Company was taken over by Royal Dutch Shell in 1962 and its gas stations were re-branded under the “Shell” label two years later. This service station continues to operate under the Shell brand today. This image shows the Silver Moon Motel, the Dutch Sisters’ Inn and Hotel, the Rainbow Motel and the Sunshine Tourist Court on Etobicoke’s famous ‘motel strip’ on Lake Shore Boulevard West, between the Humber River and Mimico Creek. During its heyday in the 1950s and 60s, this strip was dominated by motels, drive-through restaurants, dance-halls and bars. However, the area began to decline during the 1970s. At the time of writing only three of these businesses survive. Many of these icons of the 1950’s lifestyle have been demolished, giving way to the icon of 21st century living: the condominium.